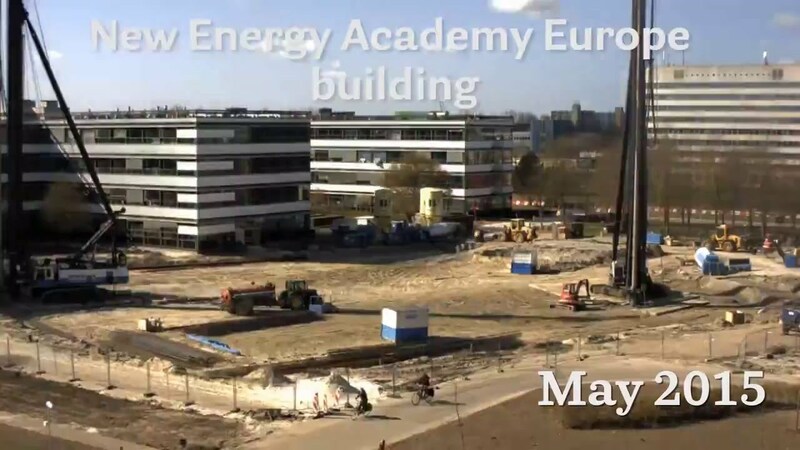 The Friso-Koopmans building consortium and ENGIE (formerly known as Cofely GDF Suez) have reached the highest point of the new Energy Academy Europe building in Groningen. The structure of the unique ‘energy roof’ can now be clearly seen. One half of the roof generates electricity using about 2000 tilted solar panels, while the other allows daylight to pass through. The building, located on the Zernike Campus in Groningen, is expected to be handed over in September 2016. In order to achieve the ambitious objectives in the area of energy sustainability, the building will have a striking structure with a large, tilted solar panel roof with a surface area of ± 4000 m 2 . With an optimal south-facing aspect, the roof will be fitted with around 2000 solar panels to collect solar energy. The 133 remarkable triangular constructions mean that the whole of the roof’s surface is covered with panels, while still allowing daylight to enter the building through the roof. This makes it a 150% energy roof. The façade also allows daylight in, while the wooden ‘fins’ there stop the sun’s heat becoming a problem. The outer shell of the building thus provides very good insulation: it keeps out the heat and the cold, as well as sunlight if necessary. The striking exterior of the building makes it immediately clear that this building is dedicated to innovative approaches to energy. The new building is set to become a sustainability icon. Its smart design will keep its energy requirements low; the building will even be able to produce more energy than it uses. The building design was recently awarded the highest possible sustainability certificate : ‘BREAAM-NL Outstanding’. This highest BREAAM rating is awarded to buildings that satisfy exceptionally high sustainability standards. There is no comparable teaching building in the Netherlands. Following completion, departments of the University of Groningen, Hanze University of Applied Sciences Groningen, Energy Academy Europe, Energy Valley and the Energy Delta Institute will all move into the new building, where they will work together and with other partners to help realize the transition to a sustainable energy future. More information about the design and details of the progress of the building work are available on www.rug.nl/GroundbreakingWork or www.facebook.com/GroundbreakingWork .